The erasure of certain chapters from NCERT textbooks has drawn attention to what the government considers to be dispensable: the choice to learn and explore. 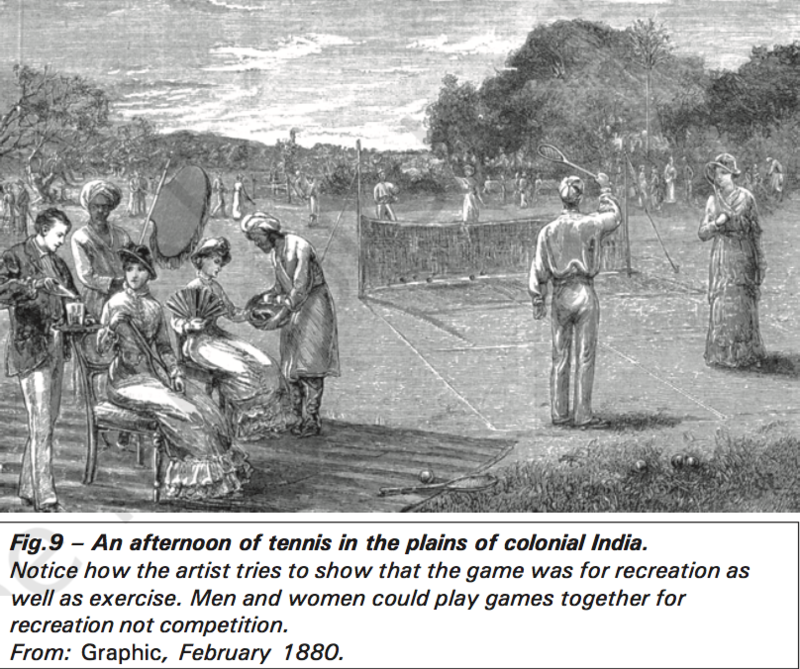 An image from the chapter ‘History and Sport: The Story of Cricket’ from the Class 9 history textbook. It appears that since history accounted for proportionately more of a single social science paper, it has suffered larger cuts, although the minister’s goal of 50% has not yet been achieved – indeed it is unlikely to be achieved in mathematics and science. NCERT officials are understandably cagey about their future plans. From 2017, they had been busy correcting and updating their textbooks: now, under pressure from the HRD ministry, they are abridging them. Meanwhile, public attention has been drawn to what this government considers dispensable – cricket, colonialism, caste struggles, capitalism, city life, novels and the literary representation of women. Last year, Anil Swarup, then school education secretary, said that he saw no need for the history of cricket to feature in the social science curriculum. Students were supposed to choose five out of eight chapters in the history textbook, and the existence of this choice apparently let to ‘confusion’. The simplest means of reducing such confusion was obviously to get rid of choice: have only five chapters, so that everyone knows what to study. Contrary to what is claimed, the examination syllabus is not reduced: only the choice is removed. ‘Choice’ is one of those dangerous elements that feature in both novels and social struggles, which are all about realising options and putting choice – often difficult, painful, or non-existent – to work. 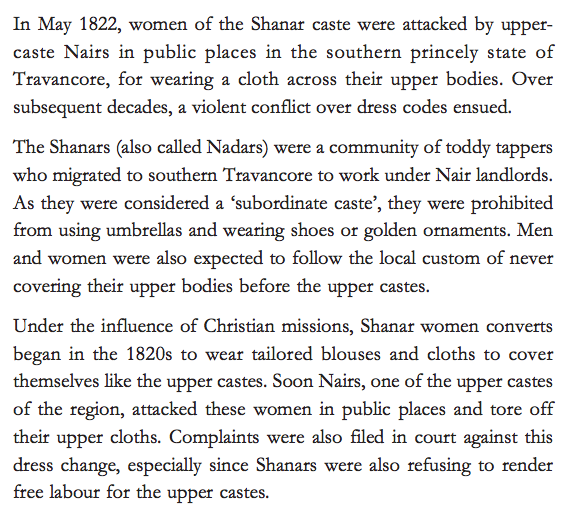 Thus the Channar revolt in 19th century Travancore, when Nadar women fought for the right to clothing to cover their breasts like ‘upper-caste’ Nairs, involved the assertion of choice in the public realm, against its denial or negation by oppressive custom. A section from Caste Conflict and Dress Change from the chapter ‘Clothing: A Social History’ from the Class 9 history textbook. Bankimchandra’s Durgeshnandini (1865), or Chandu Menon’s Indulekha (1889) feature radical, even unrealistic choices made by idealised women characters who thereby claim a new kind of social personhood. Perhaps it is no accident that precisely these accounts are sought to be excised from the Class IX and X history textbooks, removing, too, the right of children to choose what interests them in the school curriculum. Why should children or their teachers be allowed to decide for themselves what areas of social history they might explore? One curriculum, one examination, one product: the well-drilled, incurious, passive beneficiary of the government’s generosity, its reduction of the burden of learning, and most of all, the burden of choice. Perhaps, if certain elements in this government have their way, these elections may even be the last in which we, as adult citizens, are able to exercise a different kind of political or electoral choice, and our children may never have to do so. That idea of freedom and flexibility, however imperfectly translated into practice, lay behind the production of the new NCERT textbooks, which sought to open up new ways of understanding the world, of ‘doing’ science, history, geography, literature – not as a collection of facts to be memorised, but as spaces to be explored, in a spirit of curiosity, and with a measure of freedom. 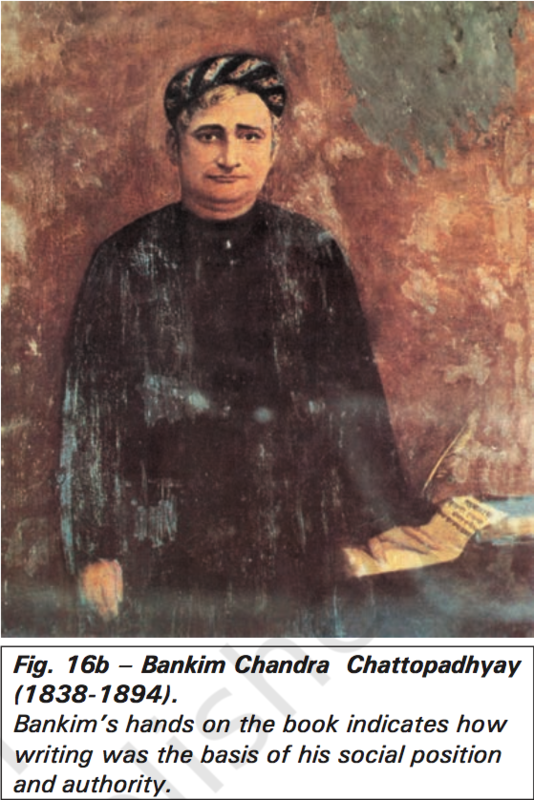 An image from the chapter ‘Novels, Society and History’ from the Class 10 history textbook. Where this effort failed, as such efforts have failed in the past, was in our inability to break the deadlock of the examination system, and to overcome the compulsion to quantify achievement through marks. The best textbooks in the world can do nothing for a pupil who is assessed on her ability to memorise set facts or to write predetermined answers. The current HRD Minister’s resolve to lessen the student’s burden by doing away with half the curriculum arises out of the conviction that the curriculum is meant to be memorised and regurgitated in the examination – what is a chapter on cricket there for, he might be saying, if the student reads it but doesn’t commit it to memory? Might it not confuse examiners – even more than students – if half of them write on novels and the other half on the Industrial Revolution? How is parity in marking to be achieved? How should schools decide on which chapters will fetch the best marks for their students – should they allow them to write on ‘low-scoring’ caste struggles, or encourage them to opt for ‘high-scoring’ world wars? The idea of a textbook that is intended to arouse the student’s curiosity, that is not merely tied to the examination, seems inconceivable. Of course the question of what is dispensable and why is not irrelevant. We should remember that in December 2016 the CBSE issued a circular to its 19,000 affiliated schools asking that the section on ‘Caste Conflict and Dress Change’, including the Channar revolt, be omitted with effect from 2017, since it was found to be ‘objectionable’. Objectionable to whom? So too, it may well be that the present regime is anxious to omit any mention of novels as instruments of social change, the Vietnam War, peasant struggles, or capitalist exploitation, topics likely to incite rebelliousness in the young. Nevertheless, the real damage that is being done here is not through the removal of interesting and varied content – damaging though that is – but through the betrayal of a promise. Surely it was to repair the deficiencies of that kind of history – the kind that is only read as a duty — that the makers of the NCERT textbooks thought of including chapters on novels, social change, women, and even cricket. 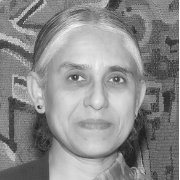 Supriya Chaudhuri is a professor (emerita) at the Department of English, Jadavpur University, Kolkata.